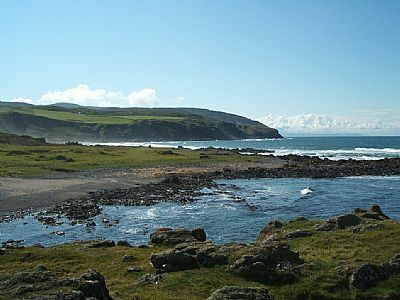 A favourite stroll from The Warren is to a secluded bay called The Gauldrons, which always seems to be full of Atlantic surf. Follow the road past the Machrihanish Golf Club and Ugadale Hotel to the end of Machrihanish village where the road becomes single track. 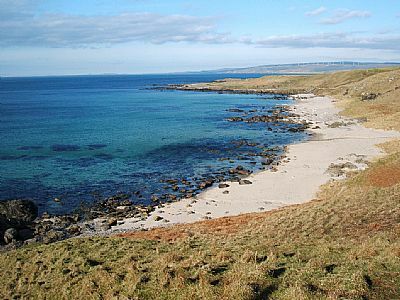 Shortly afterwards there is a signpost for the Machrihanish Sea Bird Observatory. Walk over the cattle grid and the path leads to the University of Stirling Marine Facility and a disused Lifeboat Station built in 1911 come into view. There is a trig point on the hill which is easily accessed. To get to The Gauldrons take the path which goes off to the left. On the path to The Gauldrons, there are a number of large rectangular concrete blocks scattered on both sides of the path. These are remnants of a large aerial tower constructed by Fessenden, a pioneer of transmitting radio signals. Fessenden and Marconi were locked in a race to transmit the first radio signals across the Atlantic. Although Fessenden did manage to achieve sending a signal across the Atlantic it was Marconi who proved he could transmit reliably and so his name lives on. The aerial only lasted for a few months before it fell down in one of our winter gales and all that remains now is the foundations. 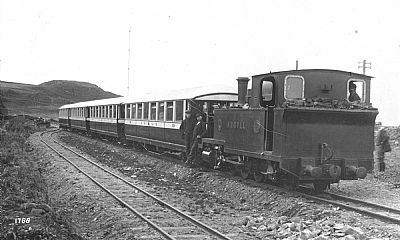 Quite by chance I found this photograph which shows one the steam trains in the siding at Machrihanish. In the background the aerial can be seen quite clearly. Soon the road becomes a dirt track and a small rocky bay is reached. Skirt round the perimeter, and then go through a small iron gate which marks the entrance to The Gauldrons proper. The bay changes its character nearly every year and sometimes several times in a single year. Sometimes the bay is full of sand, other times the sand has been ripped away to show the rocks which lay underneath after the wild conditions we experience in the winter months. The bay is a bit of magnet for keen geologists. There is plenty of evidence of volcanic activity and the basalt sills are prominent going out to sea. There are also a number of vertical dykes and one very noticeable one on the hillside. In amongst all these igneous intrusions is evidence of metamorphic rocks particularly on the outcrops on the beach itself. 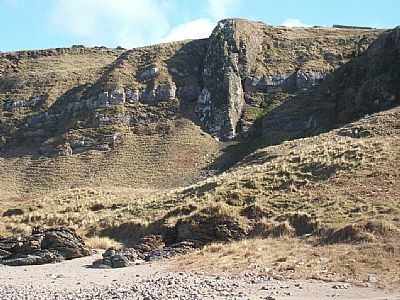 On the hillside there are plenty of sedimentary formations predominantly of limestone. 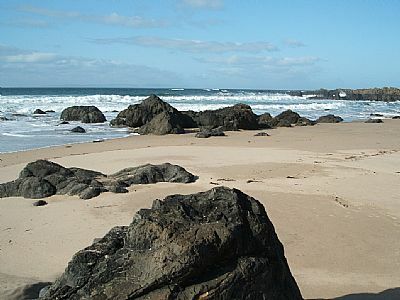 The beach itself is a real mix of sand and a variety of pebbles and stones that mirror image all the different type of rocks in the area. There is a surprising wealth of sea shells and other sea life in the rock pools which will keep the biologists enthralled for hours on end. Likewise, the botanists will have a grand time as there are wild orchids to be found. In the springtime the hillside is awash with primroses and later on the year the boggier parts have huge clumps of irises. There is also a herd of feral goats that appear from time to time. Proceed to the end of this bay which is clearly marked by a small river which has cut its way through the cliff face. There is a small waterfall further up the hill side. It is fairly easy to find a route up the hillside, keeping to the left hand side of the river, along various goat tracks to reach the plateau. From that point there is a clearly defined path which follows the cliff face and leads the walker back to the marine facility. Near to the cliff side there are remnants of what might have been a lime kiln. The path is fairly good as long as you avoid the marshy bits.